Snap(shot) Judgements are posts that will appear with no real regularity. It’s primarily a way for us to get thoughts and photos up as soon as possible, especially when we have no plan to write a feature-length column on the subject. Here, Gary embraces the presence of the ESPN Match Truck during the World Cup. Few things make me want to visit Los Angeles – as far as the west coast goes, that may be the least desirable place for me to ever set foot on. Their food truck scene, though, gives me pause. LA may essentially be a city of drivers but at least some of them drive lauded food trucks. One such truck is Kogi, serving Korean BBQ from out of four trucks throughout the city. Everything I’ve seen on their menu looks great but it’s just too bad they’re in Los Angeles. Or at least they were until the World Cup. 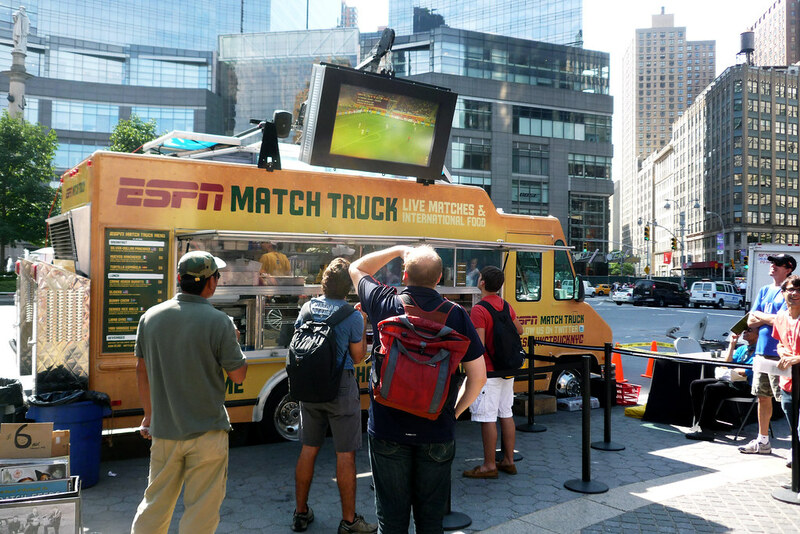 Partnering with ESPN, they’ve now got a truck here, the ESPN Match Truck, in NYC from June 11th through the 29th. The menu spans many cultures, reflecting the different nations in the 2010 World Cup. I’ve managed to make four trips over four days to the truck and I suggest you get there before they’re gone after next Tuesday.